In the springtime, the neighborhood's bicycle habit shifts into high gear. What with Bicycle Sundays along Lake Washington, the service and support at Bike Works, and all the neighbors coasting by on two wheels, there's plenty to inspire an aspiring bike commuter. Columbia Citizens working downtown and points north — did you know you have Seattle's most scenic, most fulfilling, least chaotic bike commute, bar none? Spend your gas money on pizza and pastries! Several Citizen cyclists have posted their routes. Take a look and see if they're going your way. It's fun and often helpful to connect with another rider the first time you try a new route. Submitted by Mike Jobes. Email him to ride in together. Craigslist offers online space for local classifieds. It's community moderated and largely free. If you're looking to buy, sell, connect, or announce — it's a good place to start. And now it's easy to zero in on what's available right around you. 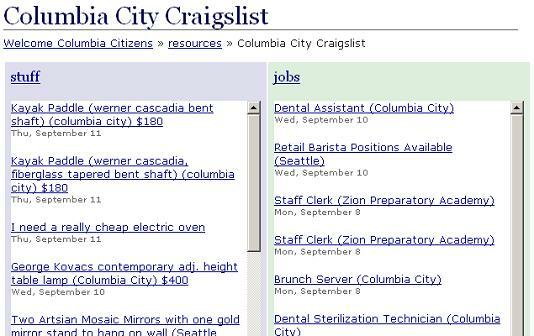 The Columbia Citizens Craiglist page shows items for sale, jobs offered, and event listings, all located in and around Columbia City. It's up-to-date and easy to skim. Why drive all over town? Here's one more way to live locally. Sustainable South Seattle (S3) are a local group who have built an online presence on Columbia Citizens, using the wiki to help coordinate their work. Sustainable South Seattle is a volunteer-run organization working to promote sustainability in Seattle's south-end communities. We have defined sustainability as "living in a manner that allows current and future generations of all life on Earth to thrive." We design and implement projects to preserve the diversity of our community's businesses and residents, increase transit and transportation choices in our neighborhoods and to provide outreach and education about environmental, social and economic choices that enhance our community. Sustainable South Seattle is a member of Sustainable Communities All Over Puget Sound (SCALLOPS) who is connecting neighborhoods who are taking action locally to make their communities more sustainable. The group has a some exciting events under their belts, and more cool projects in mind. Check them out. If you're part of a neighborhood group or want to start one, you're welcome to set up shop on Columbia Citizens. Columbia Citizens have come to the wiki by the thousands. Having found it, some are scratching their heads, wondering what's this all about? This site is about life as we know it in Columbia City, Seattle. Like many good things here, you and your neighbors get to pitch in and help make it work. It's about connecting, sharing information, and making good ideas happen in our community. Columbia Citizens can make stuff happen. The wiki is a space to work together. It's a way to get the word out. It's a venue to have a public discussion. You can learn about your place and its people. 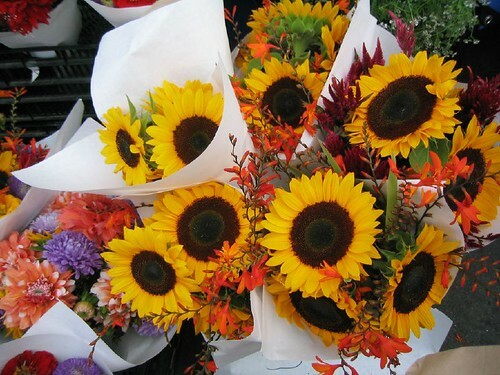 It is what you bring to it — and you're welcome to share what you know and care about in Columbia City.